This five piece modern farmhouse dining set, constructed with reclaimed pine solids, pays homage to the beauty of natural materials. The alternating grain design of the tabletop, combined with the textured white finish of the pedestal base, gives the round table a country-cottage inspired look. Offering enough space for up to eight people, this dining table is accompanied by four gorgeous wraparound barrel upholstered arms chairs. 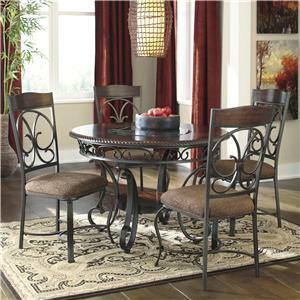 The Grindleburg 5 Piece Round Table and Chair Set by Signature Design by Ashley at Casa Leaders Inc. in the Wilmington, Long Beach, Torrance, Lakewood, Los Angeles area. Product availability may vary. Contact us for the most current availability on this product. Handles & Hardware Case hardware is a knob with hammered effect in a zinc color, or pewter-toned knobs for the dining room server. Case Construction Reclaimed pine solids in a two-tone chevron material layup. Featuring pieces constructed of reclaimed pine solids, this collection allows you to welcome the beauty of nature right into your home. Both charming and functional, these pieces showcase light weathered finishes and offer plenty of storage space for your bedroom and dining room essentials. The Grindleburg collection is a great option if you are looking for Rustic Contemporary furniture in the Wilmington, Long Beach, Torrance, Lakewood, Los Angeles area. Browse other items in the Grindleburg collection from Casa Leaders Inc. in the Wilmington, Long Beach, Torrance, Lakewood, Los Angeles area.